This week we got our Mexican Driver’s Licenses. Here’s an overview of how it all went down for us. Keep in mind that your experience may be different. Depending on where you go, when you go, what people you deal with, what their mood is, what your mood is, etc. We had heard that you need to know your blood type, as they ask for it as part of getting your driver’s license. 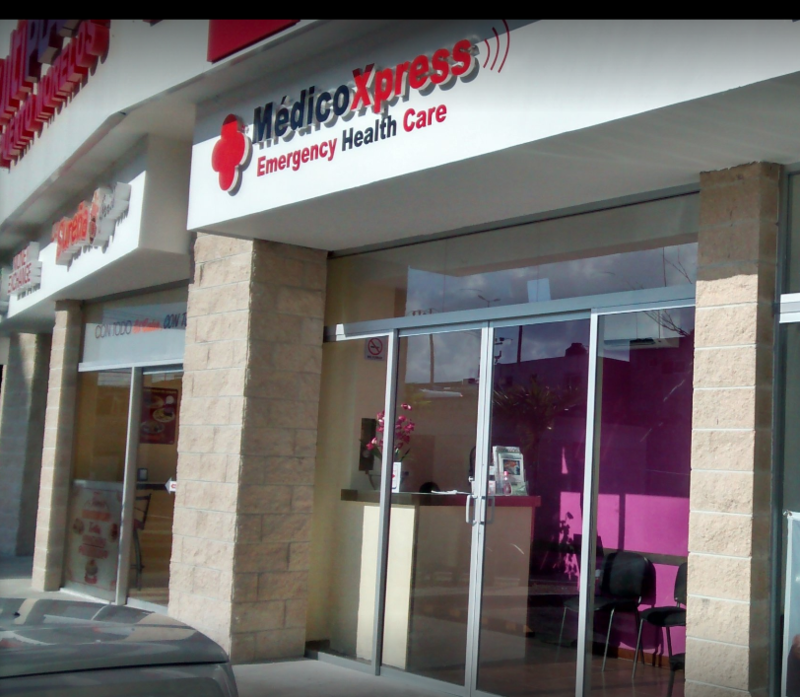 Neither Elizabeth nor I were sure of our blood types, so we went over to the Medico Xpress, which is next to the Chedraui on the highway. We went in around noon, without an appointment. We waited about 15 minutes. They draw a small vial of blood, takes 2 minutes. 110 pesos each. They said the results would be back at 7:00 PM. We came back the next day, and they had the test result papers ready to go. Pretty easy process. They do blood tests from 6:00 AM – 1:00 PM, Monday through Saturday. 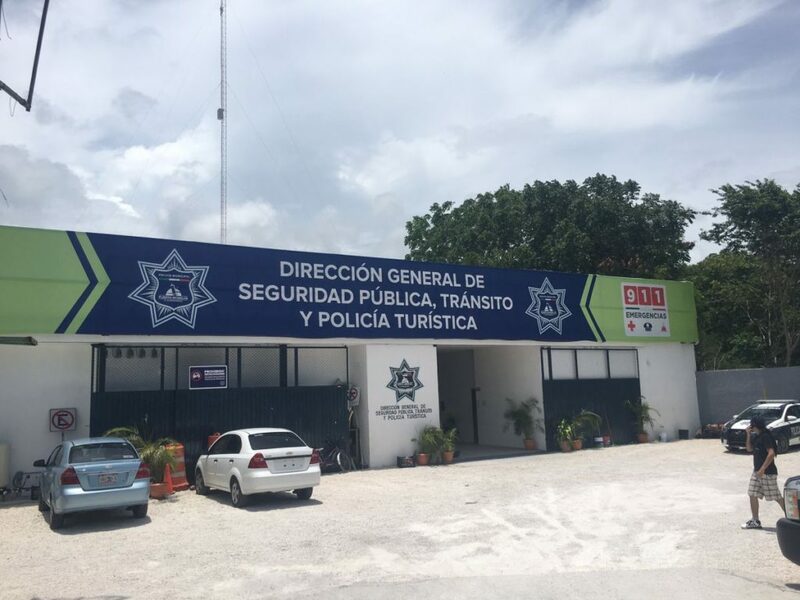 To get our driver’s licenses, we went to the Police Station in Puerto Morelos. 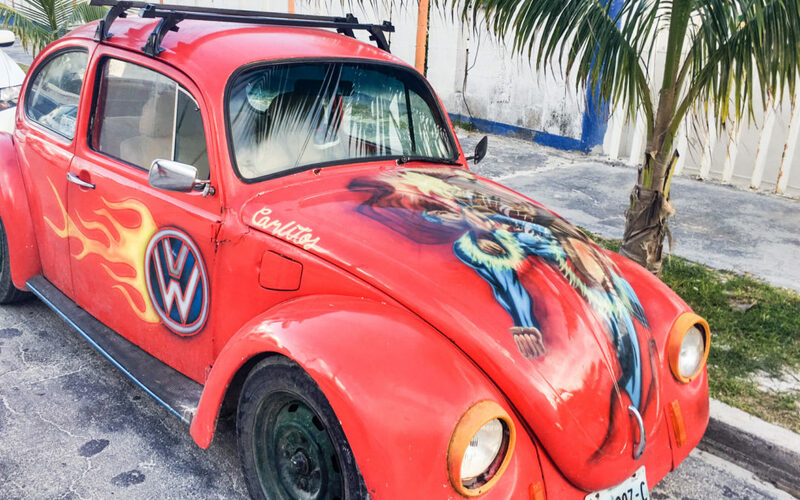 It’s on the highway, on the southbound side, just South of the Puerto Morelos turn-off. We didn’t make an appointment or anything, we just showed up. We went with a couple friends, so there was 4 of us all getting our licenses. Here’s the list of requirements, which they gave us at the police station. First stop was the Permisos office, where they looked at our docs, and had us fill out an application form. Name, address, DOB, CURP, emergency contact/etc. They wanted a picture, and we gave them the larger US passport photo (’cause we liked those photos better). They didn’t seem to care about the size. Our friends didn’t show up with photos, so the guy simply took a photocopy of their existing driver’s license, and used that. Odd. They looked at our passports and Permanent Resident cards, and took copies of those. Once we had our forms filled out, we headed to the Medical office for the vision tests. 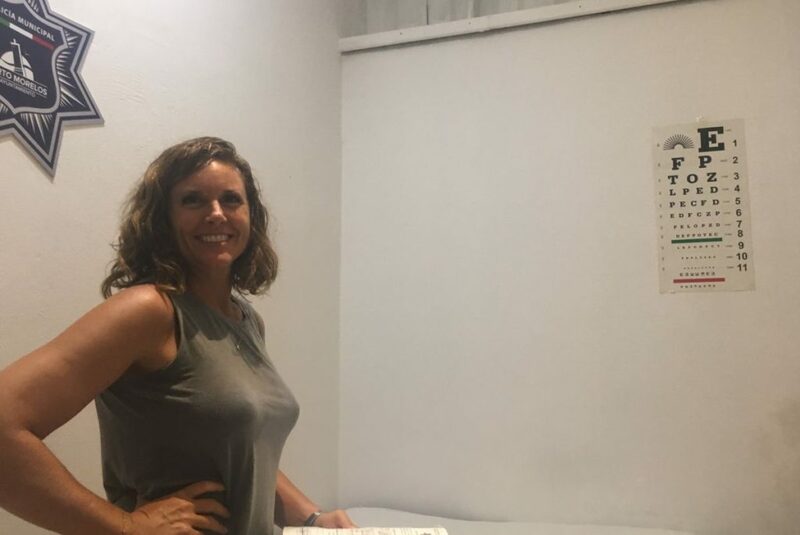 Next up, we went to the Medical Office, where we were given an old-school vision test. Sit on the chair, block each eye, and read the chart on the wall. The vision test cost 100 pesos each. We paid the nurse directly. While we were in the nurse’s office, she asked us our blood types. A verbal statement was fine. She didn’t ask for any proof or anything official. One of our friends that we were with did not know her blood type, so the nurse actually did a blood type test right then and there. A quick prick of the finger, a few blood drops on a glass slide, and the nurse did the type test. Reminds me of when we did this in science class back in 6th grade. It didn’t seem to cost anymore to have the blood type test done there. Note: This didn’t seem like the most sterile operation. The nurse didn’t wear gloves, and it seemed like the glass slide didn’t go through a major cleaning. Not a big deal to me, but if this kind of stuff makes you squeamish, you might want to be prepared with your blood type beforehand. After the vision tests, you head over to the Caja to pay. We all paid cash. No idea if they take credit cards. 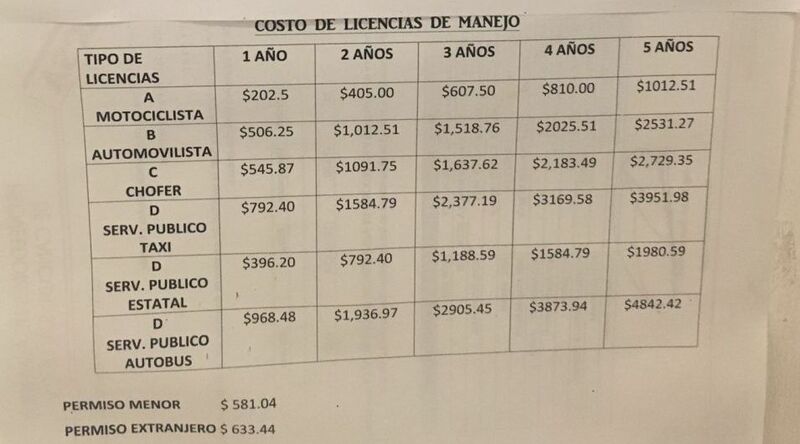 Here’s the costs for licenses. Depends on the license type, and for how long you want your license for. There’s currently an on-going discount on 5 year licenses – 50% off! Good through August 14, 2017. 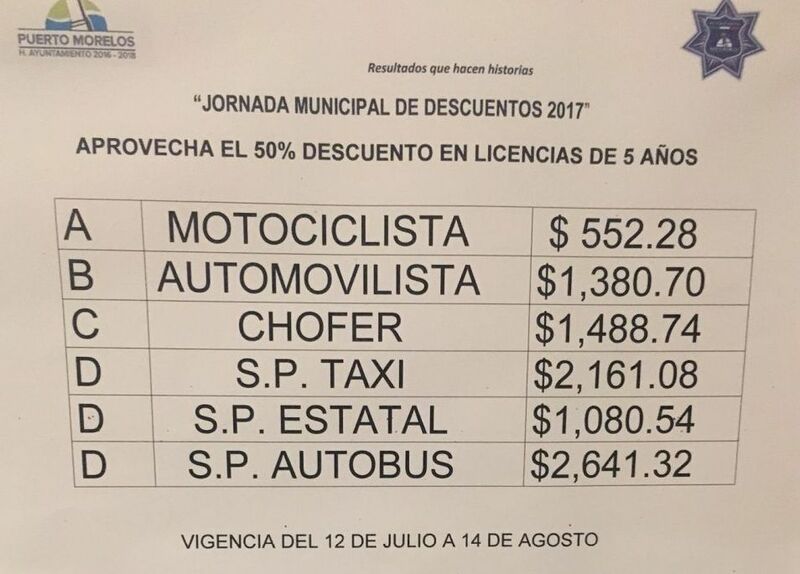 We got 5 year automovilista (motorist) licenses. So, not exactly the advertised 50% discount, but still a substantial savings! Finally, we go to the Licencias office. They enter all your information into the computer, and the take your picture with a computer webcam. They also take one fingerprint with an electronic scanner (unlike the old-school ink pad fingerprints at the INM office). We were expecting that the picture we provided earlier would be the picture used on the license. Not so. They take a new photo then and there for your license. It seems like the physical picture we provided earlier is just for their records, likely to be stuffed in a folder somewhere. Odd. This is where they also asked for proof of address. We gave them the water bill, which is in our landlady’s name. They didn’t ask for anything else from us (although we were prepared with a letter from our landlady, stating that we were renting her house, just in case). 2 minutes later, we’re handed our shiny new licenses! I was expecting that we would have to come back and pick them up at a later time. But we got them right then and there – very cool! Overall the process is pretty straight-forward. Although one of the friends we went with is a native Spanish speaker, so that made things much easier. We were in there for about 90 minutes total. 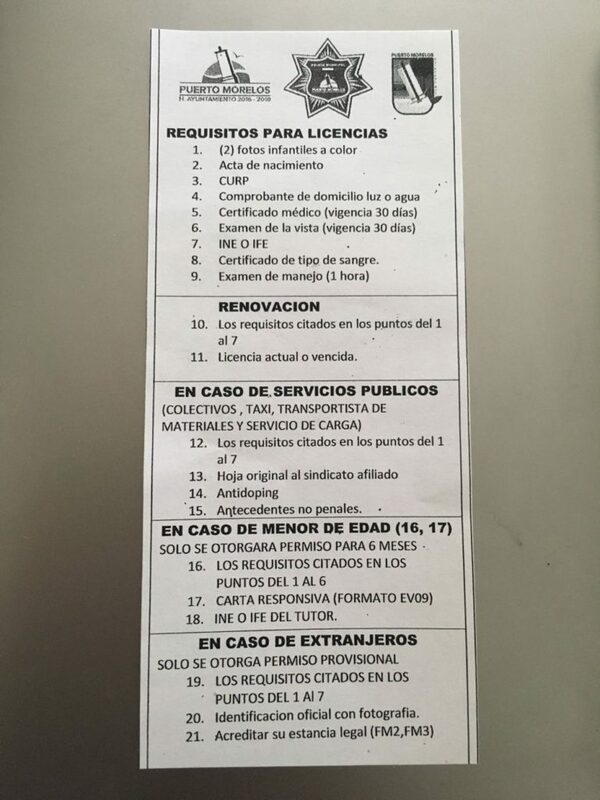 Note: all of the offices I mentioned (permisos, licencias, medical (vision/blood), and the caja (payment window)) are all in the same police station building. They’re just different offices/rooms under the same roof. Now, we’re set for 5 years, and we even got them at a substantial discount. And now we even know our blood types. Yeah, first of all – love, love, love the Basset hound. Two, you mention that you brought your MX permanent resident cards…is that status a requirement to get a MX Driver’s License? Can you also get one on a temporary resident or even tourist visa? 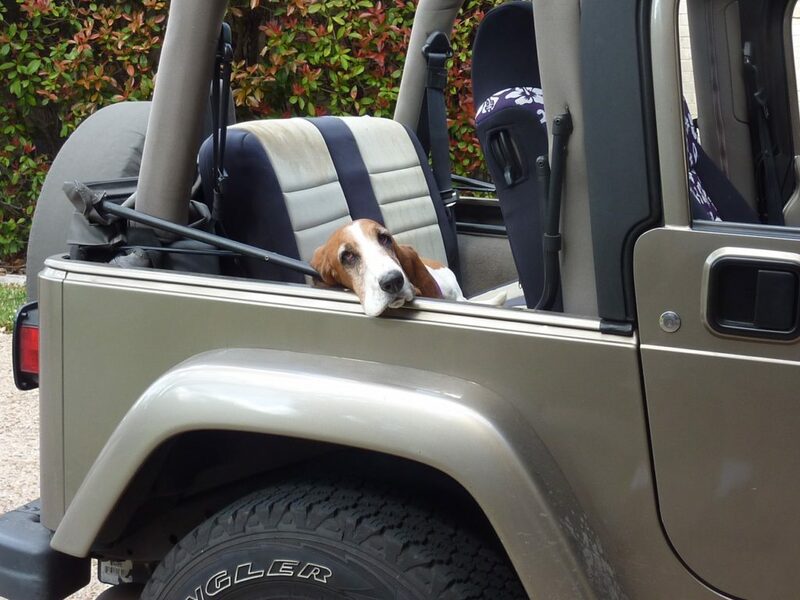 Everyone loves Bessie (our Basset Hound)! And she loves getting pets from anyone and everyone. My understanding is that you can get a MX Driver’s License on a temp resident or tourist visa, but the license expiration would expire when your visa expires. 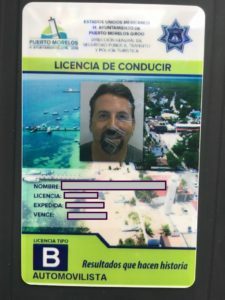 Can you get a drivers license in Playa Del Carmen if you are a tourist? The answer is yes. However it will be limited to how long your tourist visa is. Your drivers license from your home country is valid in Mexico so it is not too common for people to get a Mexican license. The rules and depending on who is at the counter can effect the answers to your questions about getting a license. If you are here on a visa temporal, you can get a drivers license up to the time when your license expires. This means that if you have a visa temporal and it is expiring in 4 months, even though you are going to re apply for a longer visa, you will only be allowed to get a 3 month drivers license. Again, this can depend on who is behind the counter. We just provide this information so you are somewhat informed about the process and regulations. Like everything else in Mexico, rules change. So do not take my word here as a definitive source. It’s just what I’ve heard. I have not verified.